The boys have been leaping out of bed at 6 lately, so we have long crazy mornings. Today, Ali was in the apartment with us, so we drew a bath and he and Baki got in. I went to the kitchen to rustle up some breakfast and Kaya ran in, stark naked having apparently changed his mind about joining the guys in the tub. After I got some clothes on him, I started grating sweet potatoes to make sweet potato hash – the fastest way I know to get sweet potatoes on my fork . You just grate the sweet potatoes on a box grater or in a food processor. Then what I like to do is sauté a chopped onion and add some minced meat. Once that is browned, I add the sweet potato and stir and scrape it once in a while so that I end up with lots of lovely browned and caramelised bits in a big mess of hash, sweet as can be. I get another pan going and scramble an egg for Kaya. Baki won’t touch eggs at the moment, so he gets apple with sunbutter. Then I crack a couple of eggs into the pan for Ali and me. I can fit a third egg in, I think, and crack another egg into the pan. And the egg stares right back at me with its two yolks. Someone laid a double yolked egg! I don’t know if it’s a one-off or not. I mean, I’ve seen baskets of double yolked eggs for sale in charcuteries in Istanbul, so presumably there are hens who make a habit of this sort of thing. All I can say for sure is, it made me smile and forget the morning mayhem entirely. It’s that time of year, right? 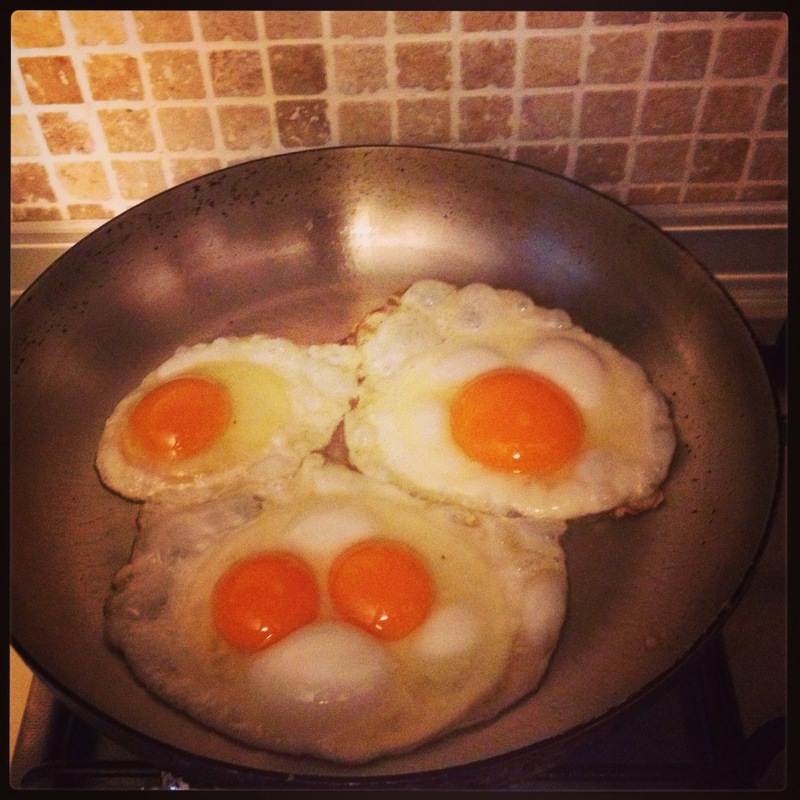 Lovelt recipe and yes, there really is something very special about a double yolker! Well, good luck comes in threes, they say, so there’s still one more to come. Maybe that one will be a lottery jackpot! Those sweet potatoes sound amazing! And a double yolker is a great way to start the day! It was a nice surprise, for sure, and that has become my go-to way to cook sweet potatoes — perfect for the impatient, disorganized cook. Haven’t had a double yolker for a while. I too get excited and find it so special whenever I get one. It made our breakfast feel special! I thought so. But I can claim no credit for it!